Here at Russell Heale we design, manufacture, supply, install and certify screw piers. These can be for a diverse range of building and construction projects, all the way to 200 tonne load bearing installations. 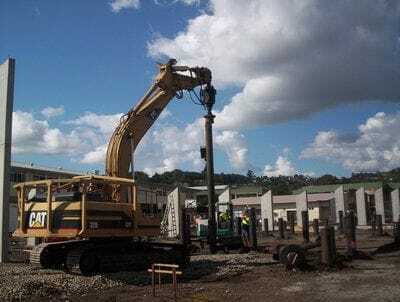 Steel Screw Piling is necessary for building foundations where the ground is not compacted, or strong enough or of variable capacity to carry the structure, for example in sand, mud or reclaimed land. Steel screw piling is a deep foundation support system that transfers the weight of a building onto the stronger founding layer below. We can use screw piles for loads up to 200 tonnes and the length of the screw piers can exceed 20 metres. To install them, we use an excavator with a power head and drive system designed by Russell Heale. Steel Screw Piles offer significant advantages over other piling types. If your job specifies concrete or timber piles, we can quote the steel screw pile equivalent.